Have safe (and fun) trip, Lynne! what a magical day that would be to come across a stenciled prayer flag in a most unexpected place ... plus the stencils are FAB. may your travels be pleasant & your visit filled with happy hearts. How cool that muslin is! thanks for sharing the color fastness of it with your ironing and washing tests for us :) I absolutely love your devil/angel Lynne, and both of those elements within you!! we got see both & know we be both as BEings in this big ol' beautiful world!! sending love along your traveling trails. Our art reveals so much about ourselves!! I thought you were probably a little devilish....lol! Love the painting! Those Caran D'ache crayons..... ooh.... I adore them so much! I didn't know you could heat set them. Good to know! Have a great trip Lynne!! The expression on Devil/Angel's face is priceless! I think she's contriving some sort of mischief. We could none of us be the angels we are without the devil to try us. And that from an atheist. Love this painting. Love your devil/angel and everything here I see. Nice to see your jewellery roll and the prayer flags...of course being a bit of a fabric-a-holic, I find these very appealing. 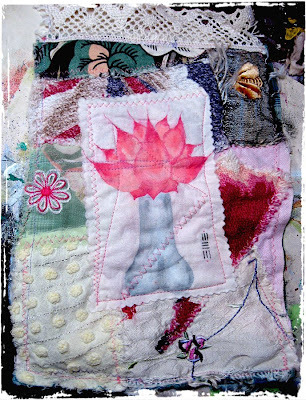 Enjoy your time with your friends and look forward to seeing the prayer flags at a later date. gorilla art for the road made me smile so much! 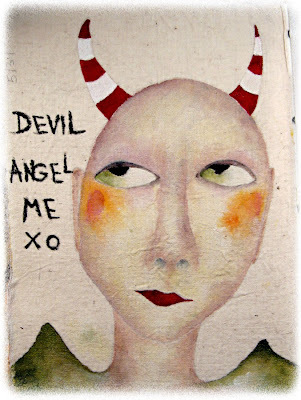 didn't know about those crayons, but i love the images you made--that devilish one looks angelic. you wouldn't shoot the messanger if we leave you a message down here on your blog would you? You do an amazing angel/devil. The picture is fantastic. stencilled guerilla flags..yeah! Loving all the cloth work. LOVE stenciling. It makes ALL the difference! I enjoy your experiments. You make me feel like being brave! It is so wonderful how our art reveals the unity of ourselves! Love your angel/devil you and the look on that face - WELL ! Have a devilish time with some angel moments! Loving muslin myself . . . as well as the stencils you've used here. Love stencils! 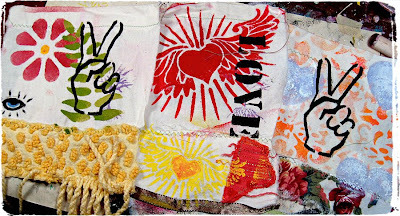 love those flags Lynne and ur stencil stuff in the previous posts. fabulous. Hi Lynne! Love those funky horns! And your pointy shoulders waiting for something to land on them. Glad you have embraced your inner devil! The texture of the muslin really shows up when you enlarge the photo. Fantastic! Love the freedom in your work!